Usually, making lunch is not a problem as I stick to dal, sabzi, roti 4 times a week with something different twice a week and Sunday lunch is usually out. So the whole week is sorted out but dinners can become a bit of a problem when I am not making soup and salad. Recently I landed up with loads of spinach (went mad at the veggie market last Tuesday) and so it was a week of spinach with practically everything. I had made crustless quiche when I was in Montreal. Made it again several times, but this time instead of baking it in a big dish, I made individual portions by using muffin cups and my, they turned out cute. I found that unlike the one baked in a big dish, where sometimes the middle is slightly soggy, these little beauties baked well all around. Just out of the oven, they make a perfect light meal with salad or as perfect party food or to carry away for picnics or even for breakfast. I like to make the quiche without the crust. If you like, you can use shortcrust pastry to make it. Heat oil in a pan over medium heat. Add garlic, ginger and chilli and stir fry for 30 seconds or less. Add chopped onion and spinach and stir fry till the spinach wilts. Take the pan off the heat and let the spinach mixture cool down a bit. Add ¼ tsp salt, cheese, and sweet corn to it and mix well. Whisk the eggs with milk, remaining salt and pepper. Add it to the spinach mixture and mix well. Spoon the mixture into the muffin cups three quarter full. Put it in the oven to bake for 20 to 25 minutes. The quiche is done when you insert a toothpick or fork in the middle of the baked quiche and it comes out clean. Serve with salad , garlic bread, soup etc. 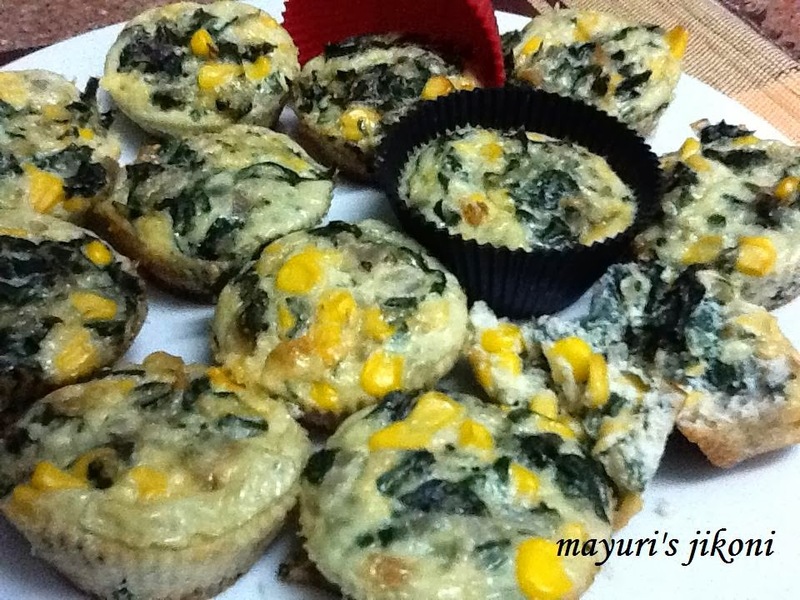 Instead of sweet corn, use steamed or cooked mixed vegetables, mushroom, meat etc. Can use cheddar, mozzarella or paneer (cottage cheese). Bake in an oven proof dish if you do not have muffin cups. wow.. thats such an inviting dish….kids will be surprised… Thanks so much for linking to my event.Looking for more..